Katherine Meifung Tsui and James Michael Dalphond were married March 14 at Boston City Hall. Maureen Feeney, a justice of the peace in Boston, officiated. 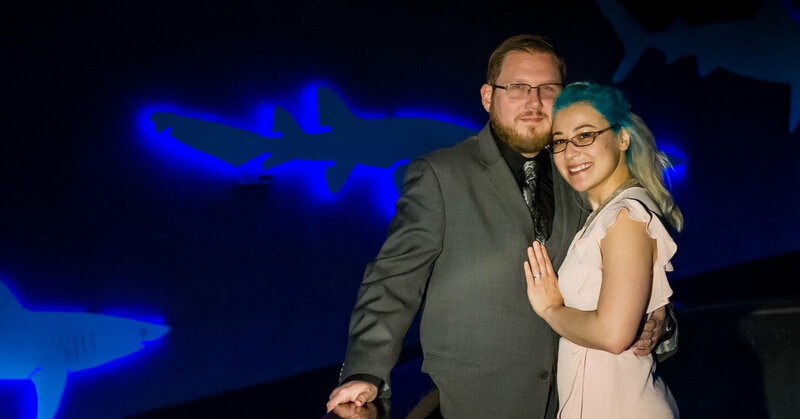 On March 16, the couple took part in a celebration ceremony at the New England Aquarium, also in Boston. Mark Sherman, a friend of the bride and groom, led the ceremony. The couple met at the University of Massachusetts Lowell, from which they graduated, and where the groom received a master’s degree in computer science, and the bride both a master’s degree and Ph.D. in that subject. The bride, 36, is a user experience researcher at Toyota Research Institute in Cambridge, Mass. She works with older adults to explore how new technologies might assist them in everyday life. She is a daughter of Theresa A. Tsui and Terence F. Tsui of Dracut, Mass. The groom, 32, is a lead software engineer at the Mitre Corporation, a nonprofit organization based in Bedford, Mass., and McLean, Va., that manages federally funded research and development centers supporting several United States government agencies. He is the son of Karen J. Dalphond and Raymond M. Dalphond, also of Dracut. Ms. Tsui and Mr. Dalphond grew up only a mile away from each other in Dracut, but they did not meet until they were graduate students at the University of Massachusetts Lowell. With a shared interested in robotics, they worked in adjoining labs, occasionally partnering on robotics outreach events. In summer 2014, they took some time away from the lab but began collecting data on each other while backpacking and camping in Nova Scotia. They began taking similar trips — “We’re both very outdoorsy and love the ocean,” Ms. Tsui said — and she became that someone he most enjoyed having in his camp. After completing her Ph.D. in October 2014, Ms. Tsui moved to Guilford, Conn., to take a postdoctoral position at a social robotic lab at Yale, but maintained a long-distance friendship with Mr. Dalphond, who continued his research at the University of Massachusetts Lowell. Two months later, they were officially dating. “I loved his willingness to come and see me on a moment’s notice and throw hot dogs on the grill or go for a long drive and explore new places together,” Ms. Tsui said. Their relationship continued to blossom, and in October 2016, Ms. Tsui and Mr. Dalphond moved into an apartment together in Watertown, Me. In February 2018, they attended a Valentine’s Day event at the New England Aquarium called “That’s A-Moray,” where people could leave messages for their dates on plastic fish suspended in the Giant Ocean tank. Unbeknown to Ms. Tsui, Mr. Dalphond had carved a box holding her engagement ring, whittling away on a large block of wood many nights after she had gone to bed. He decorated the box by inlaying it with a sand dollar they had found together on a beach. Ms. Tsui, who was described by Mr. Dalphond as “someone who is genuinely interested in how things work or why something is the way it is,” sounded like a researcher who collected more than enough positive data to conclude that for him, there were no other fish in the sea.